On Sunday, March 25, 2012, Warring Memorial United Methodist Church in Whitney, Nebraska, celebrated its 125th anniversary. The 10:00 a.m. worship service welcomed Methodist congregations from Harrison and Crawford, Nebraska -- along with several other out-of-town guests. Following the service, a carry-in meal was held in the church basement, which was brimming with fellowship and celebration. For those of us who were guests, "Thank You" to the members of the Whitney congregation who hosted this wonderful event. The following candid photos didn't capture everyone in attendance, but they do reflect a few of the festive Sunday morning moments enjoyed by all. To help us identify any photos without caption, please simply send us an e-Mail. Thanks. You'll find a few other church-related photos in our Whitney Churches Gallery. 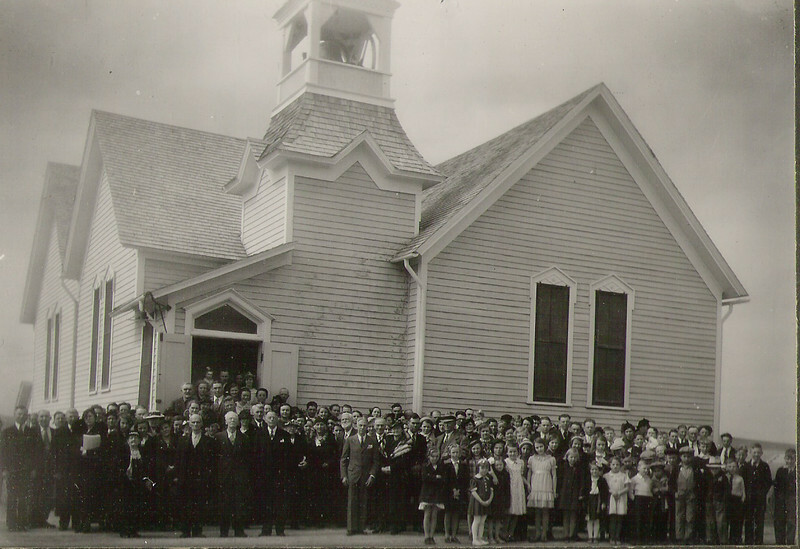 Early undated photo of Warring UMC congregation, Whitney Nebraska. Notice entry is on the east side of the church. Choose "XLarge" for best view.